Previously on Thrift-Shop Thursday, I told you about my archaeologist daughter’s last-minute quest for the perfect dig-site wardrobe— and by perfect, I meant quick and thrifty, and she meant practical, yet chic. For a girl who just today wore a black pencil skirt, charcoal-grey cowl-neck top, cream fishnet hose, and taupe heels just to get her hair done, satisfying both of us threatened to be a very tall order. Today, Valerie is my very first guest blogger, with her own take on this thrift-shop-based experience. Welcome her to Changing Your Clothes! What-ho from your guest correspondent. The above-mentioned trenches are also proverbial: I did indeed leap at the recent chance to help excavate an archaeological site within commuting distance of my home address, but we are digging in 1 x 1 meter squares! Although I insist I never actually wailed, “What do I wear?”, proper attire was an immediate concern. Because of the nature of this dig, I needed little more than the clothes on my back and the knowledge in my brain; but by the nature of my recent life, my entire closet was oriented to libraries, museums, and evening events —distinctly indoor clothes. If it were merely a question of finding acceptable work clothes, rugged and washable, it would have been a simple utilitarian jaunt to the nearest clothing-seller and this post could end with this paragraph. The trouble is that I want to raise the bar. I have seen too many archaeologists in the field, and even in their offices, looking like cast-off mummy wrappings, and I am convinced we can do better. However, I also know enough about outdoor work to know what I do and don’t like wearing, and that in the end, even I cannot long keep up the farce of impractical clothes under excuse of looking good. The needs of the activity —here, archaeological digging— must be the priority; I added the complication of wanting to find a more polished way to meet those needs, and I have reason to believe it can be done. I come from the equestrian world, which has had the advantage of fusing style and utility for centuries, and I love the blend of practicality and staunch standards. It is perfectly acceptable to come back from a ride decorated with mud, hair, vegetation, etc., and stand around in socks, cocktail or teacup in hand, acting like there is nothing out of the ordinary: the dirt of hands-on action is as much a badge of honour as the triumph over it. But by Gucci, everything had better be cleaned, pressed, and polished before being used the next day. So, my challenge is to look like myself while still looking professional, and to wear clothes that I will be equally at ease getting dirty in, and being seen by my colleagues in. Thusly I called a Joint Powers meeting, myself and your trusty fashion guide Lindy, and we came up with the battle plan outlined in her previous post: minimal wardrobe, cost, shopping time, and maximum utility. 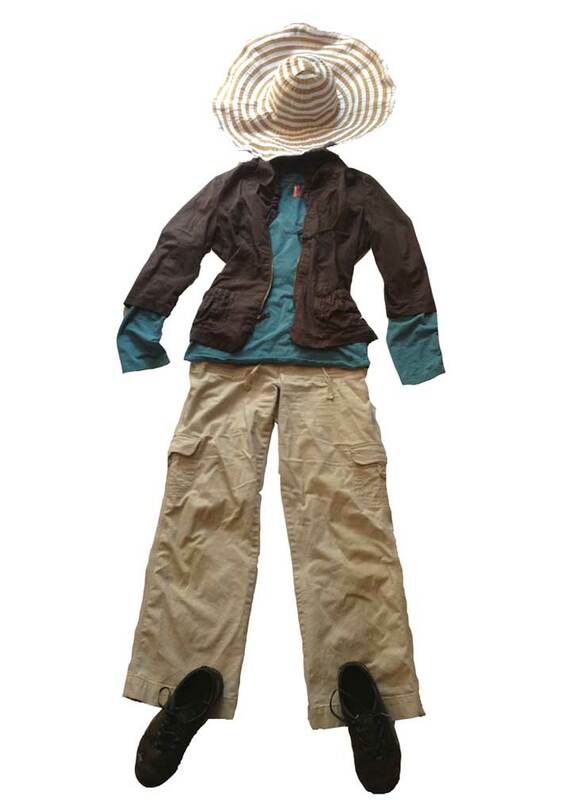 Desirable: long pants and sleeves to protect from sun, insects, general scratchy things, lightweight materials and layers for changeable weather and hard work, washable everything for reasons of dirt. For my part, I wanted cuts that I felt looked good on me, shirts in nice colours, and a Respectable Hat. Any doubts, reference the classic safari look (can one really go wrong with khaki and leather?). Start with the thrift-shops so any tactical errors will cause little financial damage. Right. The ancient Greek dramatists felt that the real rough stuff ought to take place off stage, so as not to excite the pity and terror of the audience, and I will not violate these principles by describing the shopping itself. For all my love of clothes and insistence on putting my best foot forward, I am a shockingly un-feminine shopper, and my attitude is usually get in, get out, get it over with. With a game plan, a budget, and a deadline, I gritted my teeth and set to it, and it was a success. Clothes were purchased, they have been tested in the field, and were not found wanting. However, I could not have done it without your aforementioned CYC guru, Lindy. Everything spectacularly successful in my capsule wardrobe was suggested by her, and there were moments when, but for her encouragement, I might have quailed. Shopping is not for the faint of heart. Did I reach my goal? Am I smartly turned out and fully functional in the field? Well, yes and no. I am thoroughly satisfied with my clothes, even enjoying their sharp difference from my everyday wear, feeling a sense of pride in my dust-covered role and my ability to play it. But, still I wonder if I could do better. I am envisioning custom-making my own capsule archaeology wardrobe, each piece setting the standard for looking professional out in the field, improving my look with every season… But I must end. To paraphrase what’s-his-name, “I have not yet begun to dress”! Valerie is not only an archaeologist, she’s a blogger! Read about her fascinating research project at A Year in Provenance, right here on WordPress! Categories: Fashion, Shopping!, Thrift-Shop Thursday, Wardrobe Creation | Tags: A Year in Provenance blog, archaeology, archaeology research, cargo pants, clothes for archaeology field work, clothes for sun protection, professional wardrobe, Ross Dress for Less, sun protection, thrift shop, thrift shopping, wardrobe creation, wardrobe creation strategy | Permalink. Love the blue and brown colors together and the cut of the jacket! It’s amazing how the color palette, which started vaguely with khaki, turned out to be both sophisticated and appropriate, especially considering that Valerie didn’t think she would even like these colors! That jacket was a real find ($24.99! ), and Valerie says it’s the perfect extra layer for cool mornings. That is a great price for the jacket – well done!